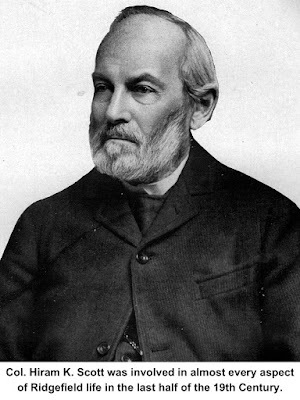 If anyone could be called Ridgefield’s “most prominent citizen” in the 19th Century, it’s Col. Hiram K. Scott, a man who was a leader in the government, civic, religious, educational, business, judicial, social, and even military life of the town. Scott was a town clerk, probate judge, postmaster, state representation, militia officer, trial justice, and a lot more. He started the first circulating library in town and founded, more than a century and a half ago, the store that is today Bissell’s Pharmacy. And if that’s not enough, he provided Ridgefield with its first soda fountain. 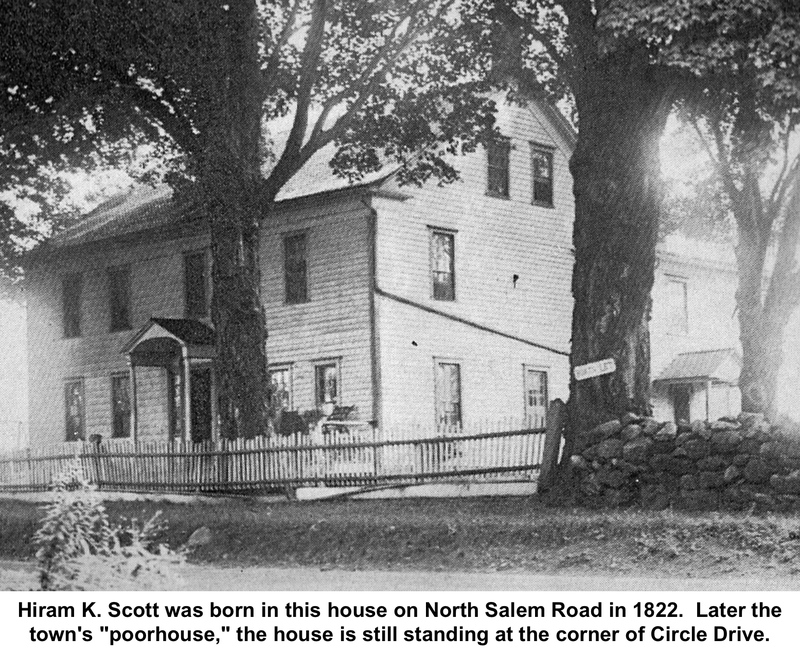 Hiram Keeler Scott was born in 1822 in a house still standing at the corner of North Salem Road and Circle Drive (it later became the town farm or “poorhouse”). He was a direct descendant of James Scott, who came to Ridgefield in 1712 and whose family settled what was soon called the Scotland district because of the large number of Scotts there. He attended local schools and, at the age of 19, became a teacher himself, probably at the Scotland or Titicus schoolhouse. In a few years he was teaching at the Center School where “many of Ridgefield’s prominent sons and daughters received their first instruction under him,” The Ridgefield Press reported. By 1844, when he was only 22, he assumed the first of many public service posts, becoming a town constable, which was then an unpaid, part-time, elective position. He also served as a town tax collector. postmaster, a job he held for 28 years from 1849 until 1886 — with some breaks in between as different political parties took charge in Washington. In 1850, he was chosen a state representative — the second youngest man in the Legislature at the time. In 1854, Scott was also elected judge of probate, a post he held for 33 years — he was forced to retire when he reached the state-mandated age limit of 65. 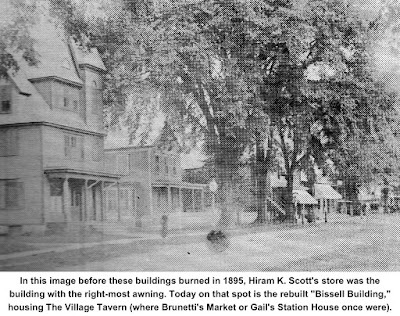 In 1853 (some accounts say 1857), Scott opened a general store on the east side of Main Street, where The Village Tavern and Interiors and Designs by Ursula are today. There he sold food, hardware, dry goods, medicines, and other items, and incorporated the village post office into the operation. In a wing alongside his building, he maintained the town clerk and probate court offices — there was no “town hall” back then. In the 1880s, the Ridgefield Savings Bank — now the regional giant, Fairfield County Bank — had its sole office in his store. Scott lived in a house behind the store. Over the years the pharmaceutical side of his business apparently grew to the point where, by the 1890s, he may have been the chief purveyor of drugs and patent medicines in town. In 1895, perhaps because of the increasing workload as town clerk as well as his age, he sold the business to Harvey P. Bissell, who made it solely a pharmacy. 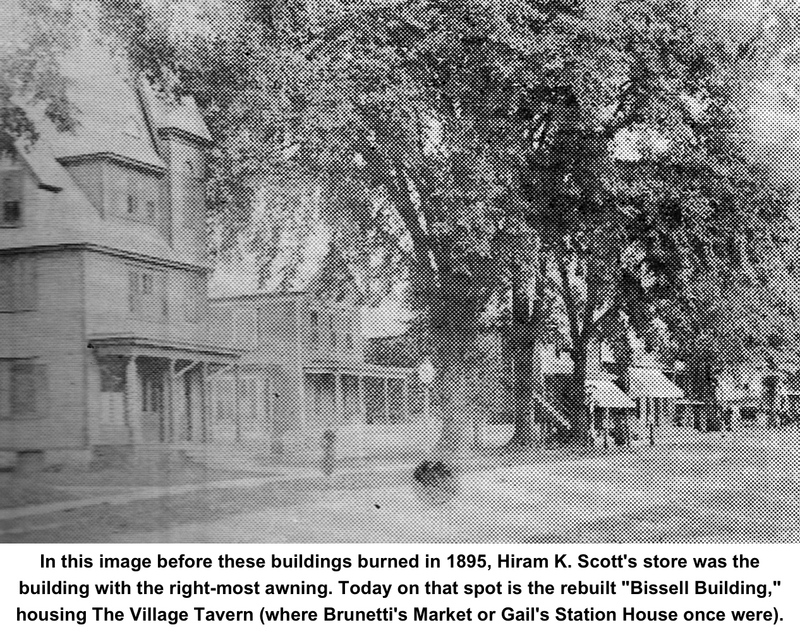 The sale was nicely timed for Scott but not so much for Bissell; four months after the transfer, the Great Fire of 1895 leveled 10 buildings on the east side of Main Street, including Bissell’s Pharmacy. Harvey Bissell quickly erected a new building that lasted until 2005 when it, too, burned down. But the venerable Bissell Pharmacy did not die in that fire either, and is still going strong today, located a couple hundred yards behind its original home. 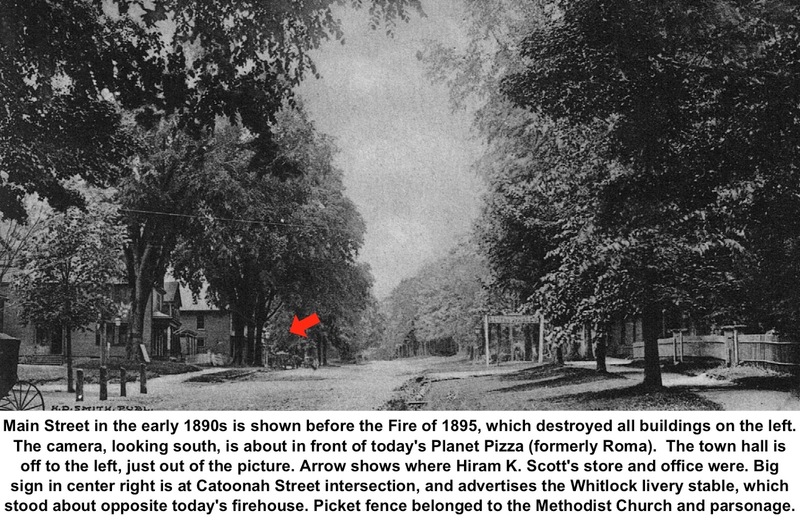 Fortunately for the town, Hiram Scott had made sure the various town clerk and probate records were safe — among the buildings destroyed in 1895 was the 20-year-old “Town House,” an all-wood structure that preceded the present town hall. Even before the Town House was built, Scott had acquired a vault to protect the records — which included about 20 large books of deeds, births, marriages and deaths. Scott talked about this during his address at the town’s 200th birthday celebration in 1908 at the town hall. “It is very remarkable that our records have been so well preserved,” he said. “For about 150 years the town records were kept in private houses — the residences of the town clerks — and not until 1853 was a safe or vault provided for their safe keeping, then a vault was built and used 20 years, then safes were bought and placed in the Town House which was built on this spot in 1876. Being a merchant and town official was hardly all of Colonel Scott’s community involvement. In 1843, he was chosen colonel of the 24th Regiment of Connecticut Militia, and remained in command of that unit until the state militia was succeeded by the Connecticut National Guard. In 1862, during the Civil War, he organized a company of National Guard in Ridgefield, was chosen its captain, and served as such for five years. Despite the lower rank of the more recent position, he always preferred to be called Colonel Scott. Long after he left teaching, Scott remained interested in education, serving on the equivalent of the school board that oversaw the operation of the Center School where he once taught. On the social side, Scott was a leader in the local chapters of the Odd Fellows and the Masons, holding top positions in both fraternal groups, locally and in the state. 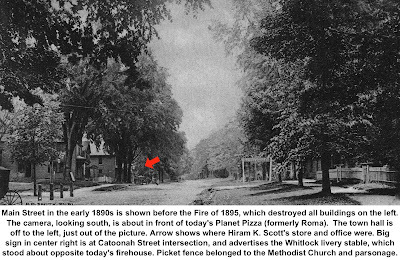 Long before Ridgefield had a public library, Scott offered Ridgefielders the “Hiram K. Scott Circulating Library.” Begun in 1852, the library loaned out books for between three and nine cents a week, depending on how much the volumes cost; back then, most books sold for less than $1 brand new, and many were less than 50 cents. But 50 cents in 1850 was the equivalent of nearly $15 today. Thus, even three cents (about 88 cents today) was a fairly sizable amount of money; nonetheless, it was a lot cheaper than buying the book. The Scott library may have inspired the Library Club, formed in 1871. People paid $3 a year to belong and the money was used to buy books that were then circulated among members. After a year or so the books were sold and a new set purchased for reading. Scott was also involved in one of several unsuccessful efforts to bring a railroad to Ridgefield center. In 1867 he was named secretary and treasurer of small group who organized the Ridgefield and New York Rail Road. This and other efforts to bring rail service to the center shocked the Danbury and Norwalk Railroad into action — two years later, it began work on its spur line from Branchville to Ridgefield center, completed in 1870. That dampened interest on building yet another line into the center of town, and Scott’s railroad never laid a track. Scott seemed rather progressive when it came to transportation and perhaps even exercise (to work off the ice cream consumed at the soda fountain?). Back in 1893 Ridgefield banned operators of bicycles — called “wheelmen” — from using the sidewalks on Main Street. Cyclists much preferred the well-maintained sidewalks to a muddy, rutty and dung-dotted roadway (bicycles, not cars, were the main reason many of the busier roads in Connecticut began to be paved around the turn of the 20th Century after the League of American Wheelmen pressed for better highways.). In 1896 when he was in his 70s, Scott joined 23 people, including some other prominent citizens, in signing a petition, asking that wheelmen be allowed to use the sidewalks. The effort failed, and it wasn’t until nearly a hundred years later that bicycles were permitted on sidewalks (as long as they don’t operate “in a reckless manner with disregard for the safety of other persons using said public sidewalk”). Colonel Scott was still on the job as town clerk when he died in 1909 at the age of 87. He had survived three wives, and had five children. One son, Hiram Jr., briefly succeeded him as town clerk and, in 1924, son George was elected town clerk and probate judge. His descendants and relatives still live in and about Ridgefield today. “So long a period of service in one community is a sufficient guarantee of Mr. Scott’s standing and worth as a man and citizen, as well as of his ability,” said The Commemorative Biographical Record of Fairfield County, published in 1899.